I remember very vividly the first time I ever had BBQ pulled pork… It was the best thing I'd ever tasted then and I've had few things that can beat it since. Though I'm a Southern girl, this was not a staple in my house or even my hometown growing up, so I had to go further afield to get my fix and over the years I've tried a lot of BBQ. From what I hear, people are very particular about their BBQ. When I visited Charleston, South Carolina a few years ago, a lady told me that the city is practically divided 50/50 between two BBQ joints that serve two very different versions of the classic American favorite. If that's what you grew up with, I get it… Loyalty to food is nothing new. That said, I have no allegiances to one BBQ over another and I particularly enjoy trying and experimenting with them all! I always make my pulled pork in a crockpot which I know isn't exactly traditional, but I want to be clear about something. This recipe is for a UK slow cooker and in my experience, they run hotter than those in the USA. If you're making this in the US, use the timing and setting you would normally use for your crockpot which will undoubtedly take longer time to cook than the below. Also, in the UK lemonade is a fizzy lemon-lime soda drink similar to 7-UP or Sprite, not a sour lemon juice drink, so be aware of that before you start making this dish. Also, don't try to do this with a diet version - the sugar is what makes it so great, so go full fat with your choice of lemonade. Finally, I'd like to say that there's no need to feel like this must be sliders. Feel free to use full-sized buns, in wraps or simply on its own alongside some potatoes of some kind, corn on the cob and maybe a bit of cole slaw. It's up to you how you serve it - it will be delicious either way! 1. Heat the garlic oil in a non-stick frying pan over medium heat. When it's piping hot, brown the pork fillets on all sides. 2. Put the pork fillets in a crockpot with the bruised garlic cloves, honey and lemonade (7-UP or Sprite) and turn the heat on low. There should be enough lemonade to cover both loins - use more if the size of your slow cooker demands. Continue to cook with the lid on for about 3 hours or until the fillets are fully cooked and falling apart. 3. Remove the fillets from the crockpot, discard the cooking liquid and clean out the dish of the crockpot as you'll use this again. 4. Remove any fat that's lingering on the meat and throw that away as well. Using two forks, pull the pork apart piece by piece, shredding it as you go until you have the consistency you like. 5. If the BBQ sauce isn't warm already, warm it up in a pan until it starts to bubble. 6. Return the pulled pork to the crockpot and add the BBQ, about 1/2 cup at a time, stirring as you go until the pork is well covered and saturated. If it's too dry, add a bit more… If it's too much sauce, don't use it all. This is all down to personal preference and how wet you want your pulled pork to be. If you're not serving it right away or if you plan to set this up buffet style, turn the crockpot on warm and put the lid on it. 7. 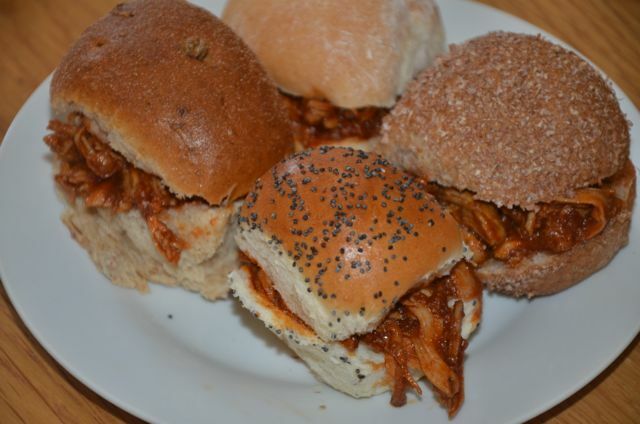 To serve, spoon some of the BBQ pulled pork onto a mini bun and enjoy!